ATAC Resources reports RAB drill go… | ATAC Resources Ltd.
November 19, 2018 – Vancouver, BC – ATAC Resources Ltd. (TSX-V:ATC) (“ATAC”) is pleased to announce a rotary air blast (“RAB”) drilling gold discovery and the final seven diamond drill hole results from the Osiris, Conrad and Sunrise deposit expansion program within its 100%-owned Osiris Project, located at its Rackla Gold Property, Yukon. Step-out drilling 60 m along the 650-850 fault corridor at Conrad returned 7.29 m of 8.90 g/t gold at the faulted contact of limestone and siliciclastic units in hole OS-18-278. A total of four step-out holes (1,638 m) were drilled at the Osiris Zone in 2018 targeting mineralization at depth. Results are presented in the table below. * The reported intersections are drilled thicknesses and are believed to represent approximately 80%-100% true width. Mineralization at the Osiris Deposit is primarily hosted: (i) in steeply dipping reactive beds within the Osiris limestone unit; and (ii) at stratigraphic contacts between units where mineralizing fluid-flow were focused. 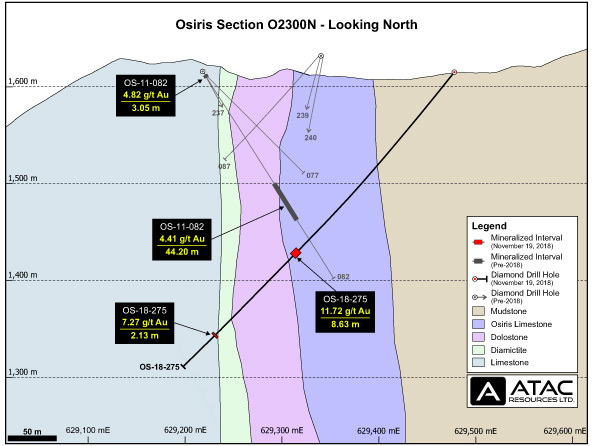 Drilling at Osiris involved stepping out along known reactive mineralized corridors within the host Osiris stratigraphy and testing the targets at depth. Hole OS-18-275 returned 8.63 m of 11.72 g/t gold at the stratigraphic contact between limestone and dolostone units. 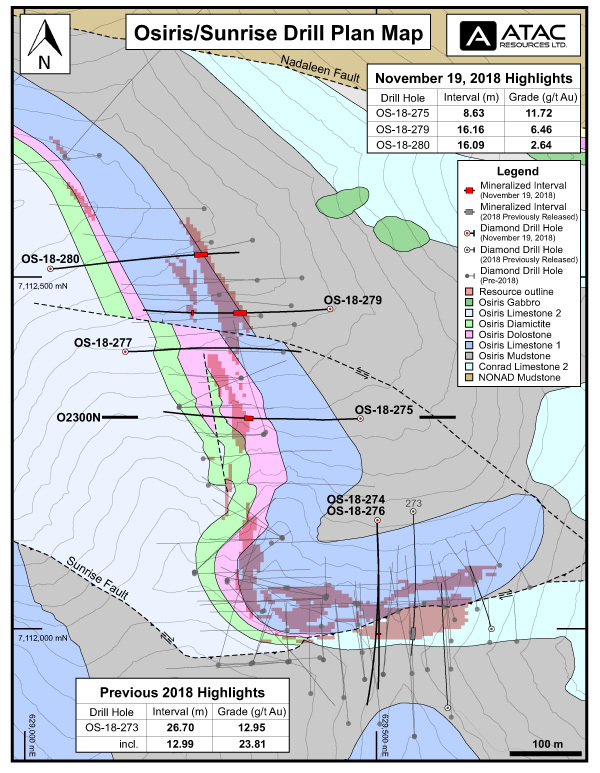 Additionally, OS-18-275 intersected 2.13 m of 7.27 g/t gold at the stratigraphic contact between a carbonate debrite unit and an overlying crystalline limestone. While mineralization has been encountered in the carbonate debrite unit before, this is the first time mineralization has been encountered at the contact with the crystalline limestone. The significance of lithological contacts in the development of gold mineralization was also demonstrated where an undercut of OS-17-244 intersected 16.16 m of 6.46 g/t gold, including 4.01 m of 20.04 g/t gold, in hole OS-18-279. Stratigraphic horizons within the Osiris limestone unit also control fluid flow and the development of gold mineralization. This was demonstrated in hole OS-18-280, which intersected 16.09 m of 2.64 g/t gold, including 2.95 m of 7.30 g/t gold. This interval was at the same stratigraphic position as 16.46 m of 5.29 g/t gold, encountered 130 m above, in hole OS-17-258. Hole OS-18-277 intersected five zones of anomalous gold mineralization and associated pathfinder elements. These intercepts demonstrate that the gold bearing fluids are still present and can be used to trace the flow of mineralizing fluids throughout the system. Two RAB holes were completed late in the exploration season to target an untested gold anomaly located approximately 1 km southwest of Conrad where prospecting grab samples in 2010 contained 2.51 g/t gold and 2.34 g/t gold. The two holes were fanned off a single drill pad and targeted the Osiris limestone unit. OSR-18-01 intersected 1.53 m of 3.05 g/t gold and OSR-18-002 returned 6.10 m of 3.38 g/t gold. Mineralization was intersected from bedrock surface and highlights the potential for additional discoveries of Carlin-style gold mineralization on the Osiris Project. Further exploration of this target will be undertaken as part of the 2019 field program. A total of eleven diamond drill holes (4,388 m) were completed in 2018 at the Conrad Zone with the objective being the expansion of near-surface gold mineralization developed within and adjacent to the 650-850 fault corridor. Hole OS-18-278, the final Conrad intercept to be reported, targeted the intersection of the 650-850 fault corridor with the Nadaleen Fault. This hole returned several mineralized intervals approximately 60 m along trend of OS-18-266, which encountered 52.91 m of 2.83 g/t gold. Results from OS-18-278 are presented in the table below. 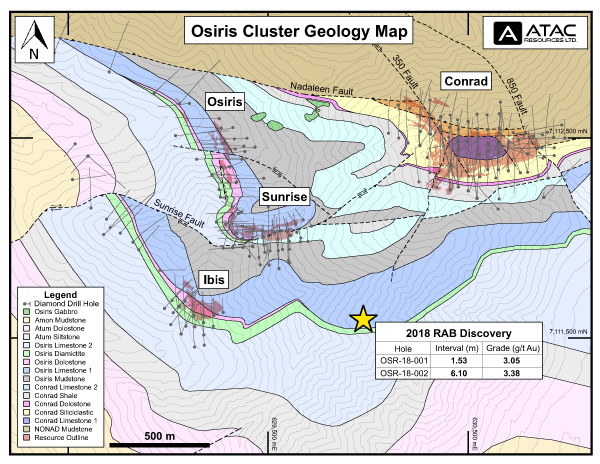 The 2018 Conrad program successfully identified new high-grade gold mineralization within, and adjacent to the pit constrained mineralization outlined in ATAC’s 2018 initial Osiris Resource Estimate. Drilling has extended near-surface mineralization along the 650-850 fault corridor 150 m to the east and 80 m to the north. Step-out hole OS-18-262 also extended the Conrad Middle Zone mineralization 90 m to the east with an intersection of 23.59 m of 9.50 g/t gold. This demonstrates the high-grade expansion potential at the siliciclastic-limestone contact. Additional follow-up work is required to trace the mineralization at depth, as the Conrad Middle Zone has received limited drilling to date. Mineralization is open in multiple directions and remains a priority target for 2019. 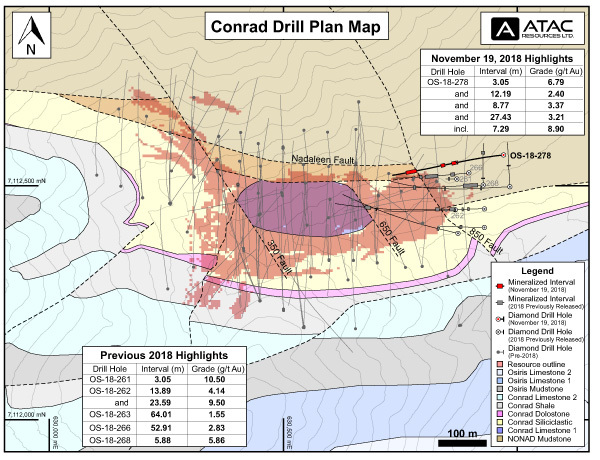 For previously announced Conrad drill results see ATAC news releases dated July 17, 2018, and September 13, 2018. Five diamond drill holes (1,753 m) were completed to expand on mineralization defined at the Sunrise Zone. Gold mineralization at Sunrise occurs as a structurally-controlled fracture network paralleling the Sunrise Fault. The final two Sunrise holes, OS-18-274 and OS-18-276, were westerly step outs from hole OS-18-273, which returned 26.70 m of 12.95 g/t gold. Hole OS-18-274 intersected a narrow zone of mineralization associated with the fracture network returning 1.88 m* of 5.67 g/t gold. Hole OS-18-276, a 140 m undercut of the mineralization in hole OS-18-274 returned a zone of anomalous gold associated with strong pathfinder geochemical response. *The reported intersection is drilled thicknesses and is believed to represent approximately 70%-100% true width. See ATAC’s website (www.atacresources.com) for updated Osiris, Sunrise and Conrad figures. The Orion Project comprises the central third of the Rackla Gold Property and is currently under option to Barrick Gold Corporation (“Barrick”). The 2018 exploration program at the Orion Project included 16 diamond drill holes (7,410 m) over a 15 km2 area. An announcement of the 2018 Orion Project results will be issued following the conclusion of a joint technical committee meeting scheduled for December. RAB drilling is a very effective exploration tool, but does not provide the detailed level of geological and structural information as does diamond drilling. Accordingly, RAB drilling is primarily used as an early to intermediate stage exploration tool and the results cannot be used for the purposes of NI 43-101 mineral resource estimates. ATAC is a Yukon-based exploration company focused on developing Canada’s only Carlin-type gold district at the Rackla Gold Property. Work on the ~1,700 km2 property has resulted in an Osiris Project Inferred Mineral Resource of 1,685,000 oz of gold at an average grade of 4.23 g/t (in 12.4 Mt) and a positive Preliminary Economic Assessment for the Tiger Gold Deposit. ATAC and Barrick have partnered to explore the Rackla Gold Property’s Orion Project, with Barrick having the option to earn up to 70% of Orion by spending $55 million in exploration. ATAC is well-financed with approximately $10 million in treasury.